He waited until she settled behind him to hand her his spare helmet. She wound her arms around his stomach, and Jonah inhaled her scent. It was strong, and it fit her, and he was so off his game it wasn't even funny. "I've always thought I only needed one chance to get it right when I want something bad enough." "You're safe with me. You're the most precious thing I've ever held." "It's not my fault, you know. If you weren't so damn beautiful, I could stop starin' at you." "Shhh, we'll figure it all out somehow." Jonah raised his head, and kissed the corner of her mouth. "We're us, and we're stronger than anything." Happiness isn't about being alone or angry. Happiness isn't in the past. Happiness is found as you turn away from the past and toward the future you make. New Adult is a genre I love, but also a genre that is easy to get bored with. I read a lot of NA, and sometimes the books work for me and sometimes they don't. The biggest factor is always whether or not the book impacted me in some way. In any way. Preferably a good way, of course. If I enjoyed the book, or if it hit me in the feels, we're on good terms. So I am now especially happy to say that As You Turn Away and I are, like, best friends. It didn't hit me until after I finished reading--and enjoying--the novel, but this story was actually so strong. And there was so much feeling. Like my last quote, the happiness one? This book has loads of stuff like that which all added up to create beautiful novel that I really ended up loving. The characters were so real and their story was about so much more than whether or not they'd end up together. We all know I love me some romance, but it's always nice for that sweetness to be paired with other stuff to not only keep me entertained (though that is largely important), but to give the characters and their lives actual depth. Quinn and Jonah (I love the crap out of their names, by the way) were two people struggling with themselves. Especially Quinn. Those struggles leaked into their relationship, causing them to break apart. And then, as good ole fate would have it, they find each other again. And that is what this novel is about--what happens when they're back in the same proximity. They're still working through their issues, and they still hold the past hurts from when they drifted apart the last time. But they still deal with each other and try to face things together. These characters...I am such a huge fan of this couple it isn't even funny. They just WORK. So well. So, so well. The story is written in third person POV, alternating between Quinn and Jonah. I loved this. Because of this, I understood both sides of the story, whereas otherwise I probably would have ended up disliking one of them (most likely Quinn, but you never know). Seeing what they were both going through, however, helped me grasp just how difficult the whole situation was for both of them, and also let me see how much they both were trying to fix things. To fix themselves. I especially loved Jonah. He was so good at saying the right things. Honestly, I heart that boy. Molli Moran's writing style was definitely something I liked. There were even little interludes between the chapters where we got flashbacks to the first time Jonah and Quinn were together. Those parts were some of my favorites, both because they were sweet and because they gave great insight into the context of the characters' relationship. I loved their beginning romance and being able to see exactly how things went down the first time around. The plot in and of itself was my kind of thing. The premise was one I loved, and the way Molli Moran told Jonah and Quinn's story worked well for my tastes. There wasn't too much lingering on what happened with other people during their time apart (i.e. I didn't turn into a raging jealous loon because of too much talk about their time apart). The couple also doesn't spend too much time apart in this novel. I mean, they aren't together the whole time. And they have arguments and whatnot. But they see each other on a regular basis. I would have hated to watch them spend loads of time away from each other when all I wanted was to lock them in a room so they could work their shiz out. - He calls her "Princess." Sort of. Kind of. Enough that I liked it but not so much that it was obnoxious. - The letter. Read the book and you'll understand why I'm hearting so hard on that letter. - The familial relationships. Both Quinn and Jonah had family troubles. In different ways, yes, but it was still there. I loved watching these two work through that and grow closer to their families in the process. They start talking about things they'd kept to themselves before, and it all works for the better. As far as things I didn't like about this book, there only a very few and they were all absolutely overshadowed by the great aspects of the story. But I wasn't a fan of Quinn's abuse. I mean, I know not all abuse is the same, and it can truly take only the tiniest of things to make someone snap (trust me, I KNOW), but only one slap seemed like a small thing to cause Quinn to go to such drastic measures. Thinking about it now, I get it. I get that THAT was the turning point, that tiny thing that made her just so DONE. And maybe it's my own personal experience clouding my judgement here, but one slap is just so...small. I don't know. I honestly think that problem with the story is just a weird ME thing. Other than that one thing, I didn't like how Jonah and Quinn spent so much time denying the obvious. They both obviously still loved each other. Wake up and SEE IT. Goodness. And then I wished I could have seen more of the couple together. Like, instead of ending where it did, it could have ended in another chapter...or two...I just really didn't want the book to end, because I wanted to see the sweet and cute! Ha. 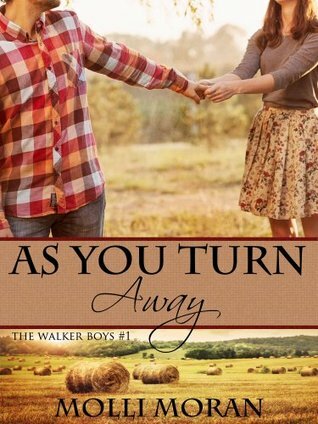 Overall, As You Turn Away was a story that ultimately did end up hitting my right in the feels. There was so much to say in this story, and I loved the characters and their evolution throughout the novel. I don't doubt that I'll re-read this book sometime, maybe more than once, and I know without a doubt that I'm going to keep my eye on what Molli Moran writes next. Whatever it is, I totally need that in my life.